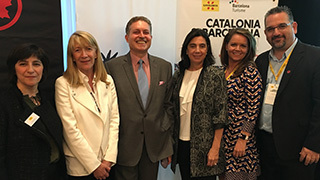 Cristina Gargallo, North America director, Catalan Tourist Board; Maria Pons, Catalan Tourist Board; Marcos Vega, Consul General for Spain; Laura Pena Alberdí, Embassy of Spain; Simona Cercel, Air Canada; Tony Celio, Air Canada. 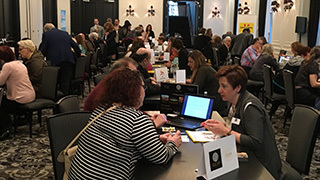 Travel agents chat with the various associations and local travel suppliers from Catalonia. Tina the Travel Agent was also in attendance and ready to learn! The Tourist Office of Spain landed in Toronto last week, following similar stops in Washington, D.C., and New York City. The purpose? A dedicated workshop on Catalonia and Barcelona. Bringing together close to 80 agent partners with 19 associations and local travel suppliers from Catalonia, including the Catalan Tourist Board, Turisme de Barcelona, the Barcelona Hotel Association, H10 Hotels, and Montserrat, among others, the evening started with a presentation about the destination, followed by a workshop and networking reception. “Tonight is about Catalonia and Barcelona and all that they have to offer, placing the focus very much on culture, in a very wide sense. 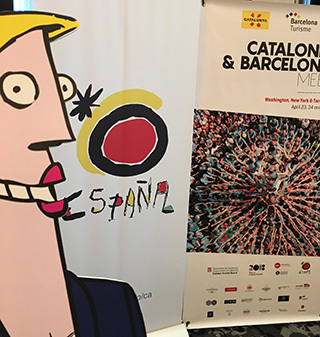 Not only in art and heritage buildings but also in the gastronomical experiences and the ambiance of the different cities,” said Laura Pena Alberdí, consul in charge of tourism affairs for the Embassy of Spain in Canada. 2017 was indeed a record year for tourism to Spain, with the country hitting a new all-time high of 81.8 million tourists, an increase of 8.6% from 2016, and positioned Spain second after France among the world’s most visited countries. In fact, from Canada alone, arrivals grew by 25.2% in 2017. Forecasts for 2018 suggest another positive year for Spain’s tourism industry, including a moderate but steady growth predicted in the number of Canadians planning on visiting the country. Numbers that, according to the Tourist Office, position Spain well for an expected increase in airline capacity – something Air Canada agrees with.